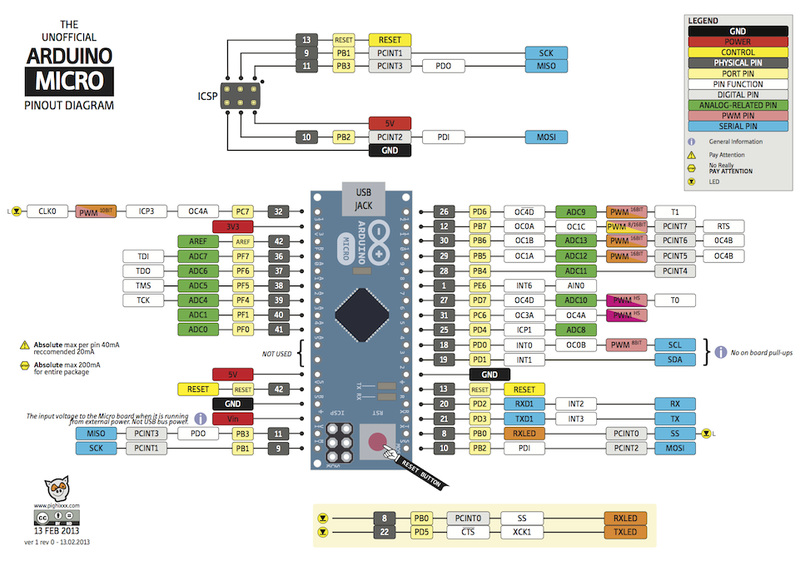 The Arduino Micro has 24 usable i/o pins, as many as on a Teensy 2.0. Same ATmega32u4. Not a Pro Micro, a Micro. There is an official Arduino Micro. This is a redesigned clone I found on Aliexpress. It shares the same pinout, but has all of it's components on the top of the PCB. The bottom is completely flat. It also comes without the ISCP header installed and uses a smaller reset switch. Very low profile compared to the official Arduino Micro. You can find these on Aliexpress by searching for CNT-013. They are also very cheap for what they are. Currently $3.50 each plus shipping, that's the same price as the smaller Pro Micro clones. Most other Arduino Micro clones are selling for twice that price. Like the green Pro Micro it has a simplified power supply. Otherwise it should work just like a genuine Arduino Micro. Low profile with a smaller reset switch than what is used on a genuine Arduino Micro. The bottom has no components. The genuine Arduino Micro has the power supply components on the bottom.